Home - The Printer, LLC. 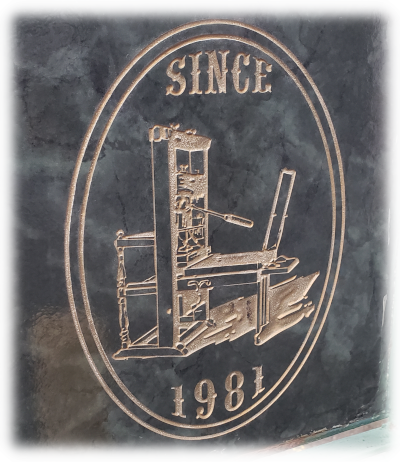 We have been printing for Alaska since 1981! Whether you're an individual, small business, large corporation, or a government agency, we want to work with you! We are Alaska's one-stop shop for notary supplies. Our online shop makes ordering your stamps easy. Your designs can be etched onto a variety of materials, such as wood or glass. How do we do it? We do it with lasers! Since its founding in 1981, The Printer has been happy to serve Alaska by providing quality printed materials to our customers. We are a family-operated business that strives to help other businesses succeed. Whether you need large banners to make your business stand out, notary stamps, name tags for your employees, or personalized engravings and decals, we have the equipment and space to get the job done. Do you have something that needs to be made? We want to hear your ideas and make them a reality. Contact us today so that we can discuss your project. If you wish to place an order or receive a quote, please e-mail us, as we are unable to take orders over the phone.